Congratulations to W.Bro. Ariel I. Roque, PPrGSwdB, or should it “Rocket”, in his appointment as ‘PAST GRAND PURSUIVANT’, a well earned honour to both himself and the Lodge in general. We wish him well and know he will enjoy his investiture in April. 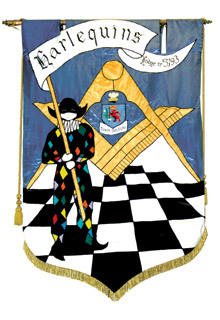 Harlequins Lodge has an indisoluble link with Llanfair Chapter, where most levitate to continue their Masonic Journey, which today has an added “Lustre”, in that our most venerable member R.W.Bro. Gareth Jones, OBE, PGM, has this day been invested by ME Pro First Grand Principal Peter Lowndes as Most Excellent Companion Gareth Jones, Third Grand Principal. Brethren, I am delighted to announce that the Most Worshipful The Grand Master in his capacity as First Grand Principal has appointed Excellent Companion Gareth Jones, Past Deputy Grand Sword Bearer, who is better known in the Craft as Provincial Grand Master for South Wales, to succeed Most Excellent Companion David Williamson as Third Grand Principal in Supreme Grand Chapter, with effect from the Annual Royal Arch Investiture on 28 April 2016. On that day I hope to have the pleasure of installing him.